To celebrate Dave Coleman's 35th birthday, Hannah and I joined him on a quick jaunt up the North Couloir on 5162' McClellan Butte, just south of I-90 at exit 38. (As an aside, the so-called "North" Couloir appears to be a "Northeast" Couloir to me, it really even looks like it faces east-northeast.) Anyway, we drove up the logging roads to snowline near 1900 ft, where a fork heads off to the right, and parked in the middle of a shooting range littered with thousands of spent shells and bullet casings. Certainly one of the finest spots in the entire Cascade Range. We skinned up the logging road at 8:45am on continuous snow, though only about a foot deep. 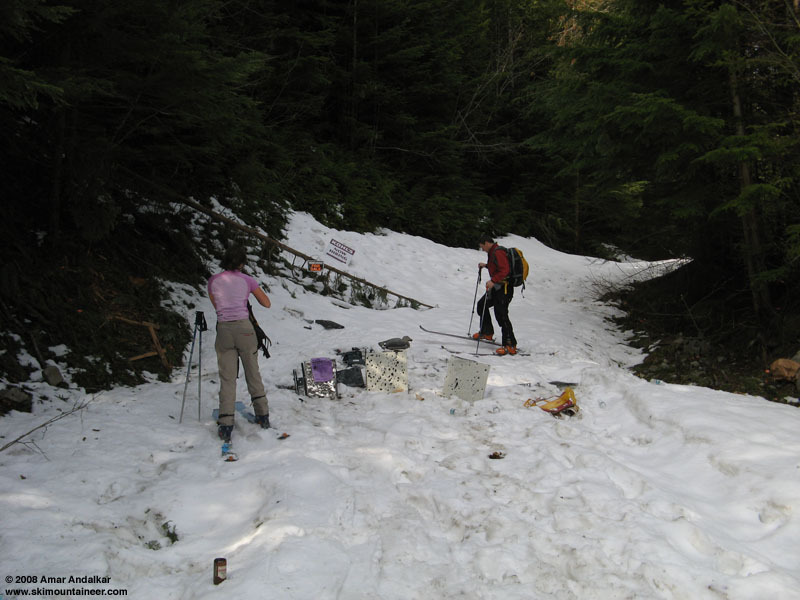 The snow deepened quickly as we headed up, but the consistency changed only from slushy to mushy and not anything better. We left the logging road near 2800 ft (?) and spent a bit of time routefinding and bushwhacking through the woods before eventually arriving at the foot of the couloir, which consists a HUGE apron of avalanche debris that is probably several dozen feet deep. 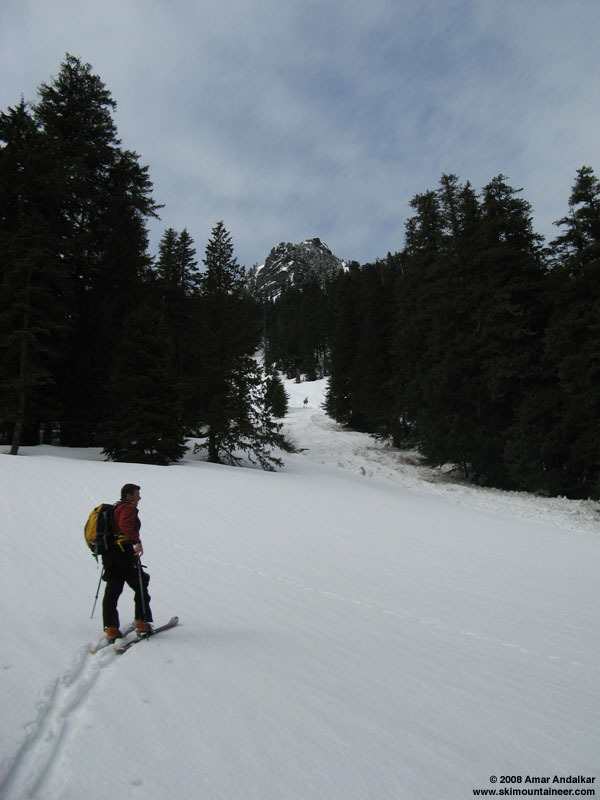 Approaching the foot of the couloir, with the peak far above. Dave set a steep skin track switchbacking up the couloir.� The lower portions had a surface of smooth untracked heavy wet snow which had consolidated from 9+ inches of new snowfall on Wednesday (April 30), but above 3800 ft the surface consisted mostly of fresh avy debris which had come down as rollers and sluffs during Thursday's warm sunny weather (May 1). A mostly-cloudy sky was keeping things stable during most of our ascent, but at 11am there was an increase in filtered sunshine followed almost immediately by a new rounds of rollers, pinwheels, and sluffs coming down the couloir. I thought the snow stability was quite marginal, since pole penetration showed about 20-30" of isothermal glop atop an old crusty layer, and it was only getting worse with the sunshine. Above about 4200 ft, a thin discontinuous layer of graupel or hail sat atop the snowpack. Dave skinning high up in the debris-filled couloir. Hannah had already stopped in a safe spot farther below, fearing the worst for the ski conditions, and I finally decided to pull the plug near 4400 ft and ski down. Dave was far above, and managed to skin to the top of the couloir, before booting up the last steep face to the highest snow beside the summit block, near 5000 ft. 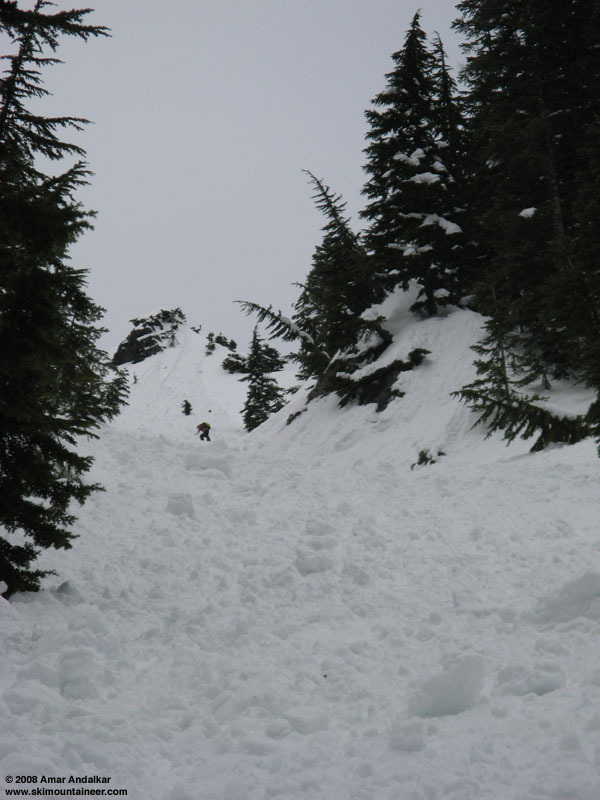 The ski descent was quite arduous for me in the heavy wet avy debris choking nearly the entire couloir, although Dave reported excellent packed powder in the upper few hundred feet (sure). 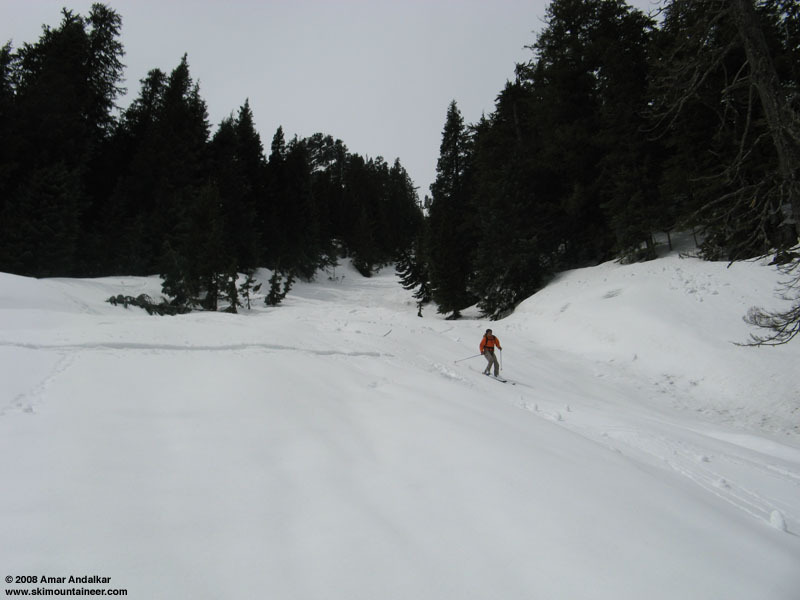 Ski conditions improved below 3800 ft with the smoother snow surface, but still required massive efforts to carve an arc through the deep mush. Despite the marginal stability, we triggered only the most minor of surface sluffs during our descent. Dave eventually caught up to us near the foot of the couloir, and we traversed a hard left through the woods to avoid the bushwhacking problems of our approach. With better routefinding, we had a fairly easy and quick ski out to the logging road, and a quick schuss brought us back to the (thankfully not bullet-riddled) car before 12:30pm. Even though the snow conditions sucked, it was still fun to get out and ski with friends. Happy birthday, Dave! Kudos to Hannah for getting me out, although the alternative of her & Amar coming over to make breakfast sounded good the night before. I SWEAR it was packed-powder on the upper face and the last couple hundred feet in the upper couloir; otherwise, I'd have turned around. Unfortunately, I forgot to grap my camera out of my car at N. Bend. Thanks for the fun trip. "I SWEAR it was packed-powder on the upper face and the last couple hundred feet in the upper couloir;"
When it's your birthday David you can declare conditions of your favor! Glad you guys got some skiing in before the loooong night ahead, and to still have energy for parting and dancing into the wee hours of the morning, impressive! !